Isn’t there always room in your closet for one more bag? 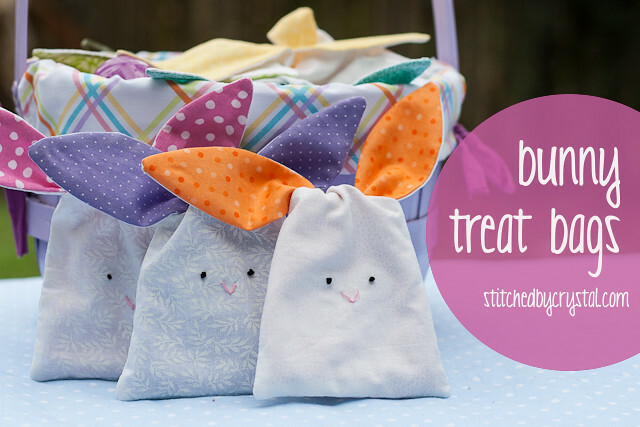 I love making bags; they are easy, quick and useful too! 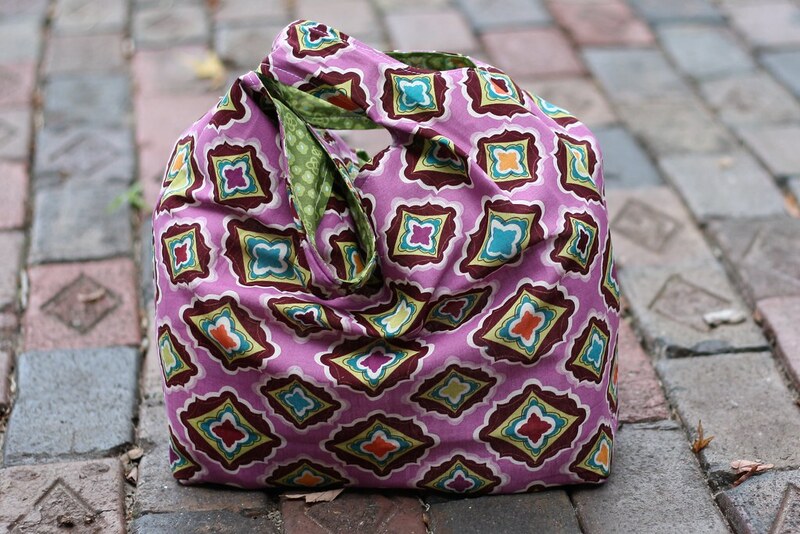 And I make a lot of them, like this grocery bag, this beach bag, or this leather clutch. I made this bag a few months ago and shared it over at SNAP. 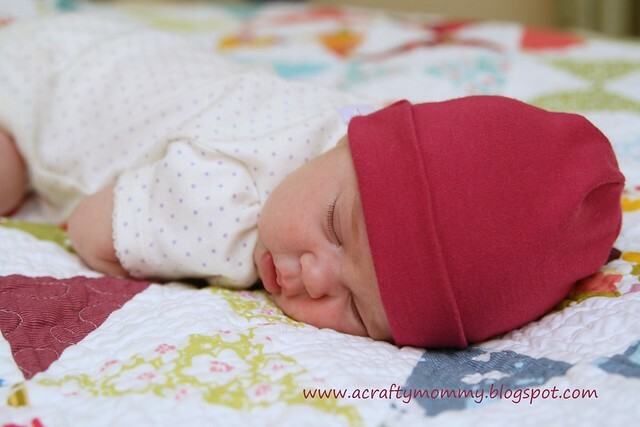 Today I am sharing it here with you! 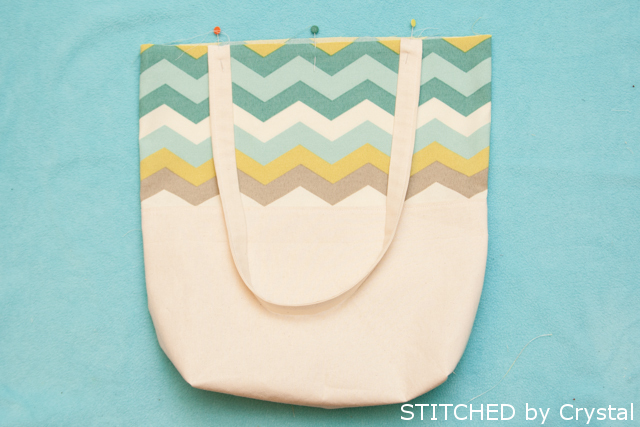 This color block tote measures about 16 inches x 16 inches. I added a little pocket on the inside to keep me keys and phone in so they are easy to find. 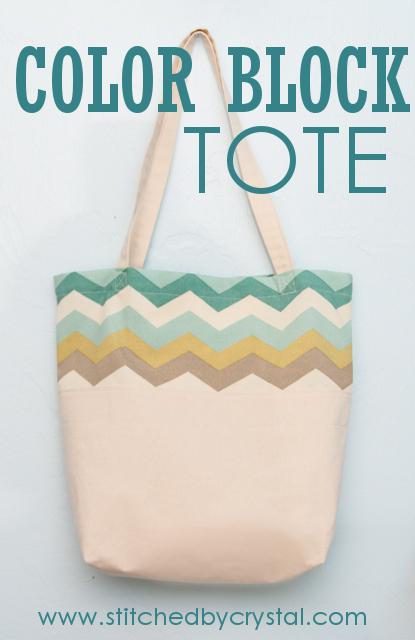 This bag is perfect for the beach or pool this summer, or would be great just for running around town too. Wnat to make one? 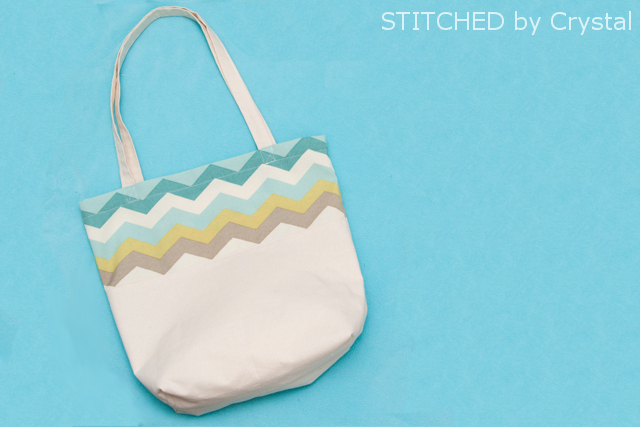 Let’s make a bag! For durability, this bag should be made out thicker fabric, something like canvas, twill, duck cloth, or corduroy. Try looking in your fabric store’s home décor, apparel, or utility fabric sections for something you like that has some weight to it. 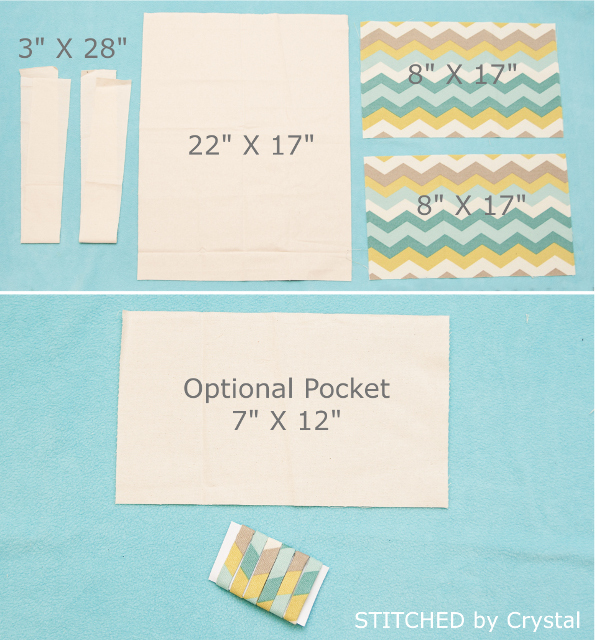 Some double fold bias tape if you want to add a pocket. From the 2/3 yard, cut one 22 inch x 17 inch rectangle and two 3 inch x 28 inch rectangles. From the 1/4 yard, cut two 8 inch x 17 inch rectangles. 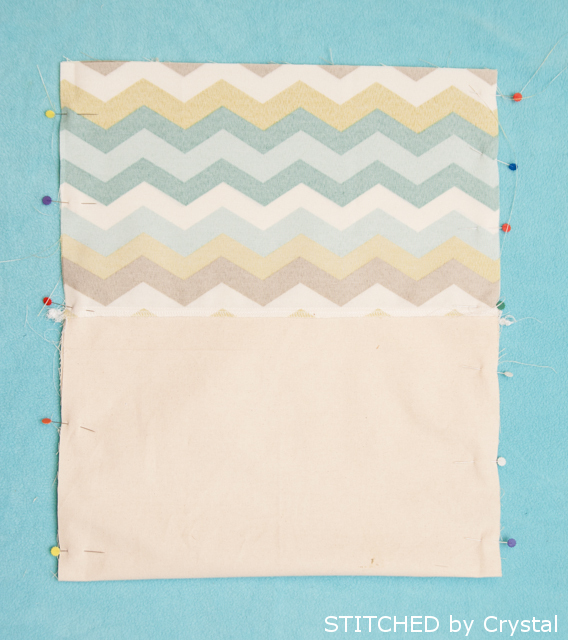 To make the pocket, enclose one of the 7 inch edges of your pocket piece inside some bias tape and sew it in place. Fold that end up about 5 inches and sew two more strips of bias tape on the sides to cover the raw edges. 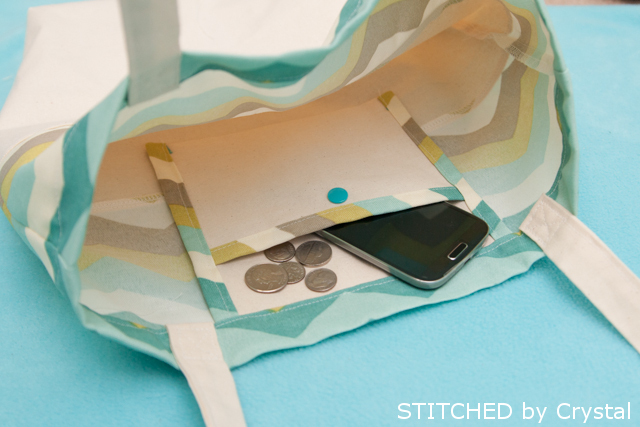 If you want, you can add a snap to keep everything inside the pocket. Set your pocket aside. Next, prepare your straps. 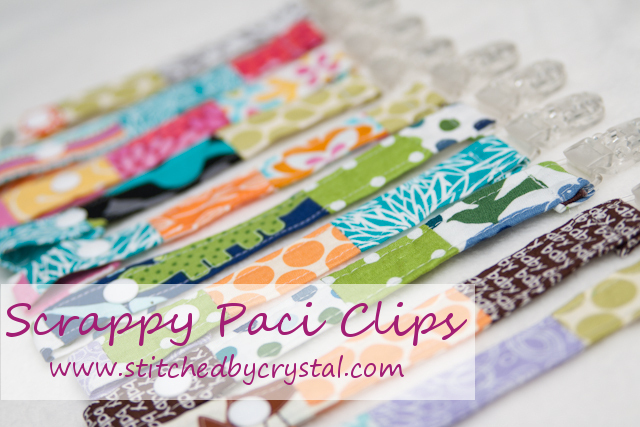 Folding the edges in 1/4 inch then fold the strap in half and sew along the edge to close the opening. Set the straps aside. Line up one of the 17 inch sides of the bottom bag piece and one of the top pieces with the right sides together. 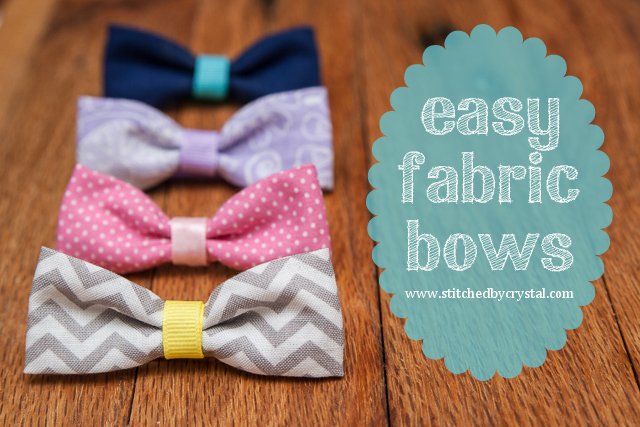 Sew along the edge with ½ inch seam allowance. 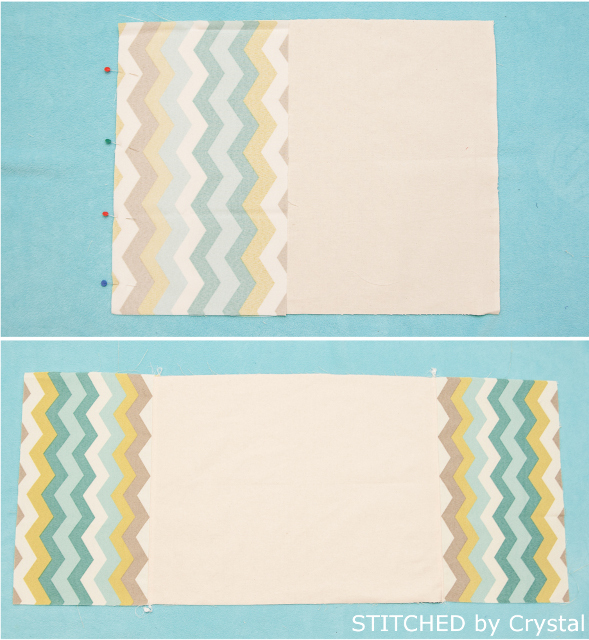 Finish the edge with a serger or zig zag stitch on your sewing machine. 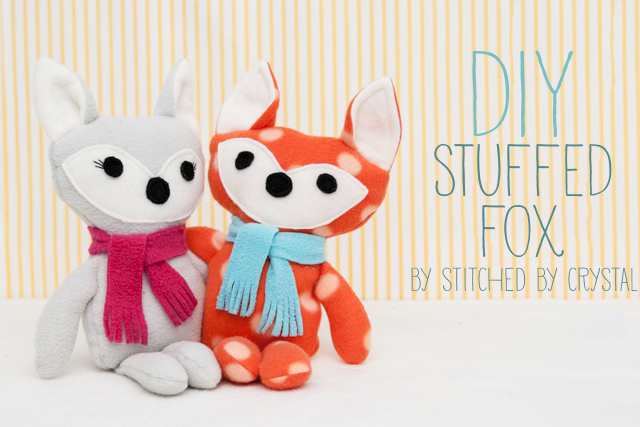 Press the seam up and top stitch. 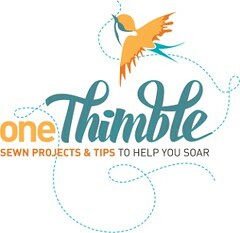 Repeat those steps to sew the other top piece on the other side. You should now have one long rectangle with the bottom piece sandwiched between the top pieces. 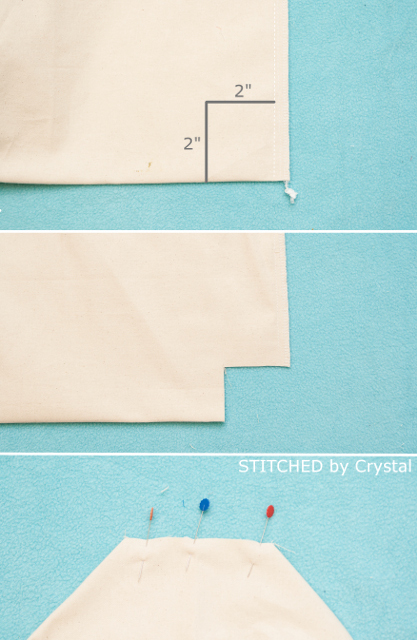 Fold the bag in half and pin, lining up the seams where the top fabric meets the bottom fabric. 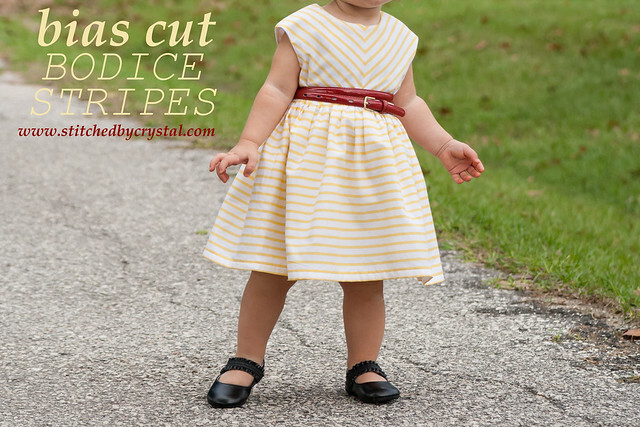 Sew the side seams and finish the seams with a serger or zig zag stitch. 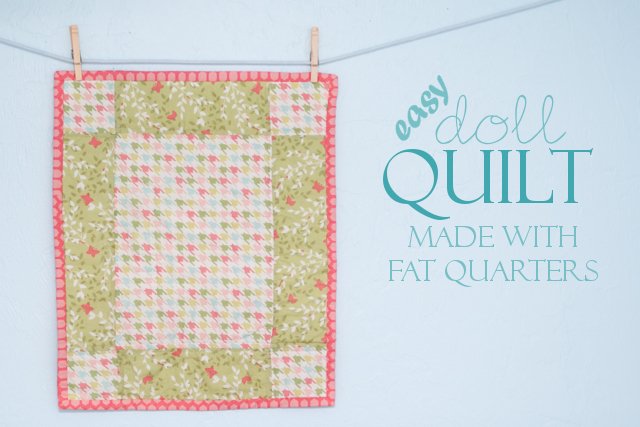 Create gussets at the bottom by measuring 2 inches over from the side seam and 2 inches up from the bottom and cutting a square out of the bottom corners. 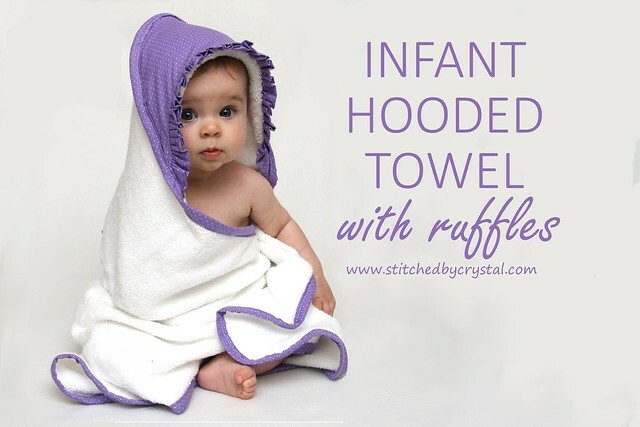 Pull the fabric apart so the raw edges line up and sew across the gusset with ½ inch seam allowance. 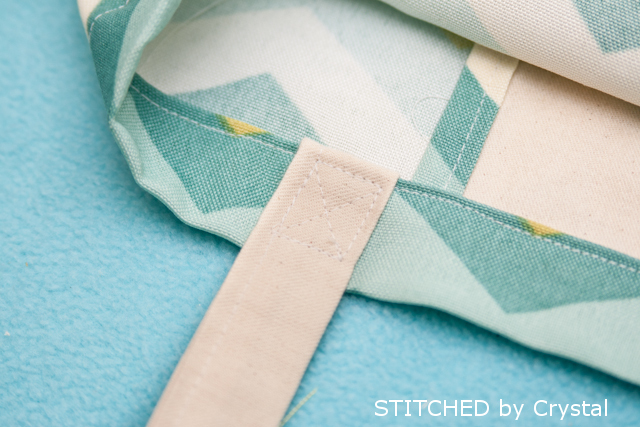 Finish the seams with a serger or zig zag stitch. Find the middle of one side of the bag. Pin your strap about 3.5 inches from the middle on each side. The raw edges of the straps should line up with the raw edge of the bag and the strap should be pointing down. Baste the strap in place. Repeat with the other strap. 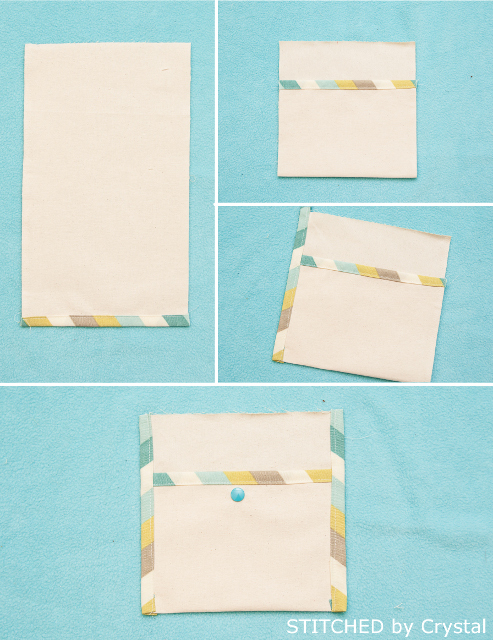 Hem the top of the bag by folding the top edge down ½ inch then another 1 inch press and pin in place. The straps will be down inside the bag. 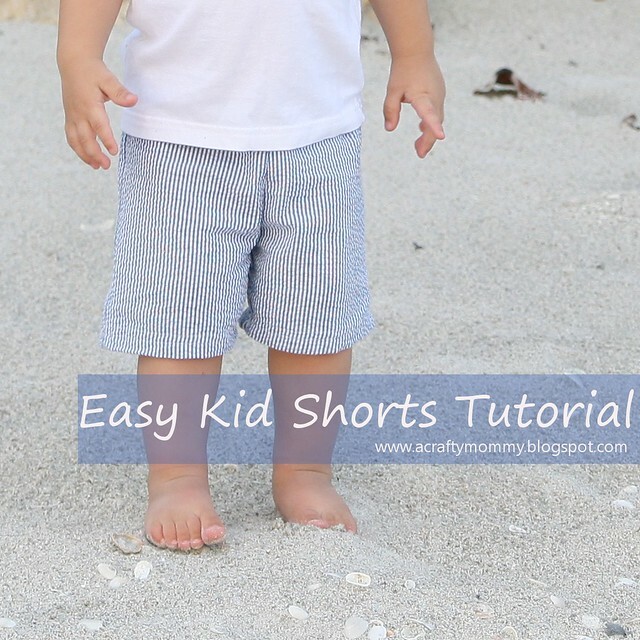 If you are adding a pocket, tuck the raw edge of the pocket into the hem between the straps on one side. 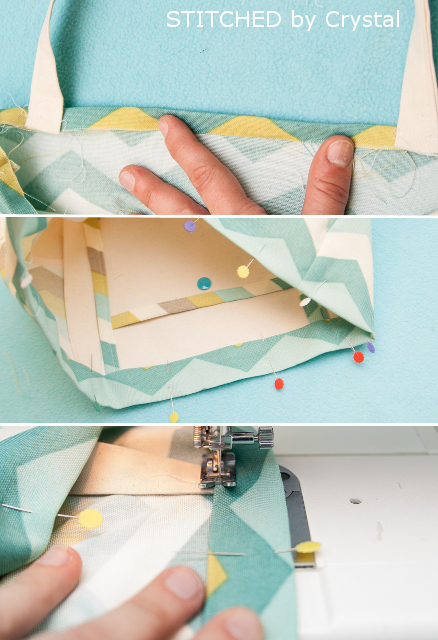 Sew along the folded edge to hem the bag and secure the pocket.